Professor of Counseling, Dr. Sam Gladding, published a new textbook with Pearson, Family Therapy: History, Theory, and Practice. In the 7th edition, Dr. Gladding covers all aspects of working with couples and families. 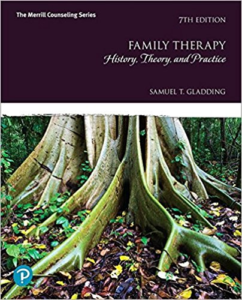 His text is grounded in evidence-based practice and the theoretical background of marriage and family therapy. Dr. Gladding provides information on functioning families of all types and compositions, and how individual and family life cycles intertwine. Also included are extensive chapters on various family counseling theories and interventions, with a wealth of examples and case scenarios. Dr. Gladding has counseled individuals, families, and couples since the 1970s. Over the course of his career, he has penned more than 100 professional publications during his career. Dr. Gladding has also served as the president of multiple organizations, including the American Counseling Association and the Association for Counselor Education and Supervision. In addition to his strong history of leadership within the counseling field, he currently teaches Family Counseling to graduate students in the Wake Forest University Master’s of Counseling program.